Being a pet owner we want our pets to live long healthy, happy lives. With that means looking for products that are both good for them and easy on my pocket giving the biggest bang for the buck. What I like about TerraMax Pro Premium Omega-3 Fish Oil is that I can use it for our 5 cats and 2 dogs. I love product that have multi uses. Even though we go through our bottles quickly it is one of the least things we can do for our pets. Plus my kitties love their food even more with a little sprinkle of this on top. You can purchase TerraMax Pro Premium Omega-3 Fish Oil on Amazon . What Terra Ma Pro has to say about their product. Fish oil is one of the most important supplements to help keep your pets body and mind in top shape. The omega 3 fatty acids in fish oil provide widespread benefits. It helps support healthy skin, coat, joints, heart, kidney and the development and maintenance of the brain, eyes and immune system. It also helps promote weightloss in overweight pets and may help reduce certain allergies. But, ...not all fish oil is created equal. The source, purity, and concentration make a huge difference in the quality of the fish oil. TerraMax Pro's Premium Omega 3 Fish Oil is the highest quality fish oil you'll find anywhere. Carefully crafted from deep-sea, cold water fish and molecularly distilled for purity from all toxins, it's refined for maximum potency without the overwhelming scent of other fish oils. * EPA, one of the two omega 3 fatty acids in fish oil, acts as an anti-inflammatory, which can help with any condition that causes inflammation of the heart, kidneys, skin, and joints. * DHA, the other omega 3 fatty acid in fish oil, is important in brain and eye development in puppies and kittens and is recommended for pregnant or nursing pets. * It can help ease inflammation due to allergies, and reduce dry, itchy skin. This can be an effective way to potentially decrease the incidence of hot spots. * It promotes a shiny, healthy coat, and may reduce shedding (For cats, this may mean fewer hairballs, since they won't pick up as many loose hairs while grooming). Only the finest fish oil is used for TerraMax Pro's Premium Omega 3 Fish oil: Wild Sardines, Herring, Anchovy and Mackerel. 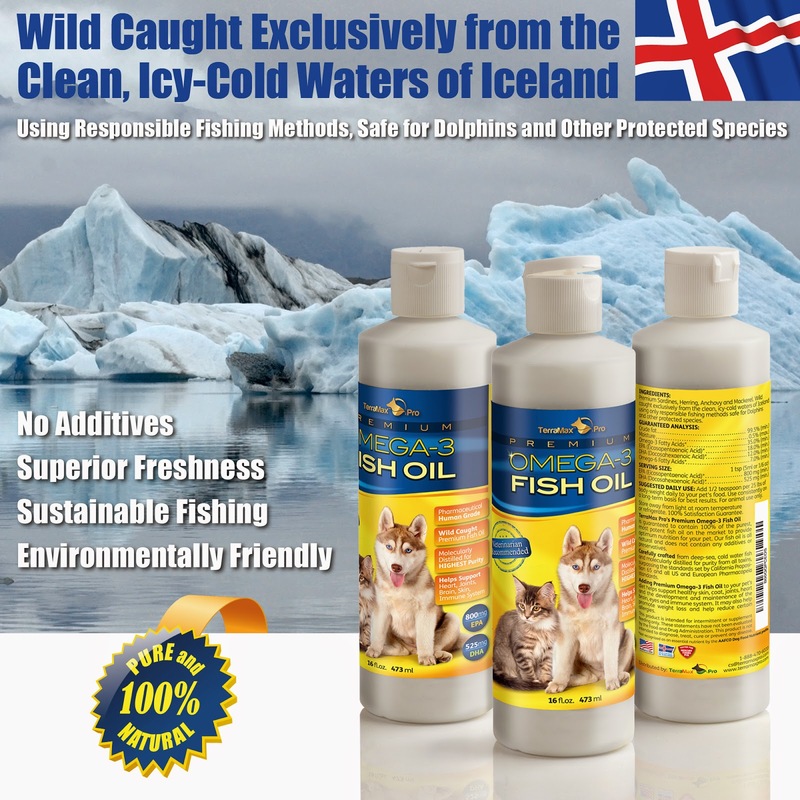 Wild caught exclusively from the clean, icy-cold waters of Iceland, using only sustainable and environmentally responsible fishing methods safe for Dolphins and other protected species. The fish oil is then purified with one of the best purification methods that exist, called Molecular Distillation. Molecular Distillation is one of the few methods that can remove heavy metals, PCB's and other toxins to below detectable limits, making it safe for consumption. 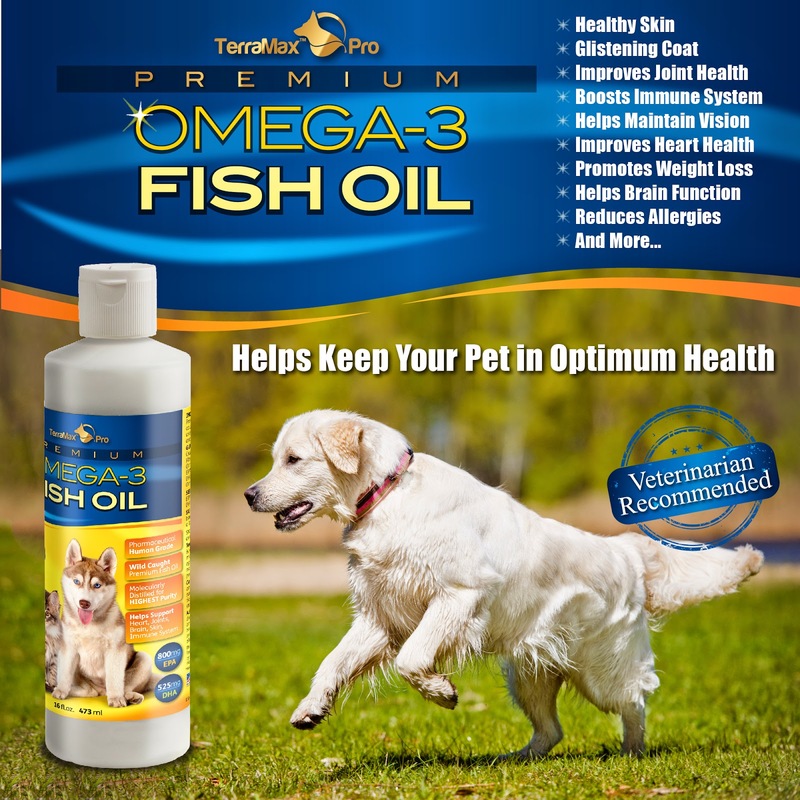 TerraMax Pro's Premium Omega-3 Fish Oil is guaranteed to contain 100% of the purest, most potent fish oil on the market to provide optimum nutrition for your pet. 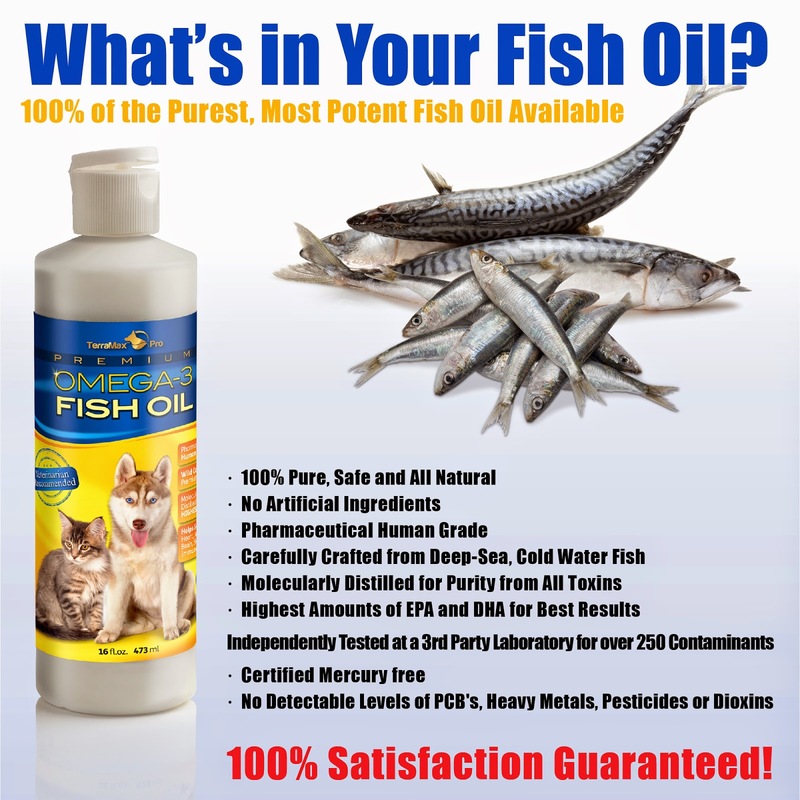 Our fish oil is all natural, human grade and does not contain any additives or preservatives. The proven science behind our product makes it truly unmatched! Our proprietary formulation means a 100% Unmatched Experience. Try it now, keep your pet active, healthy and happy!